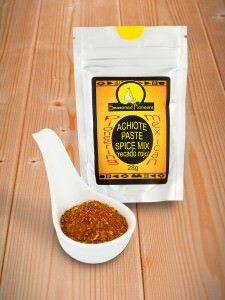 Mix together the orange juice with the juice of one of the limes, crushed garlic and Achiote spices in a large bowl. Tip in the chicken wings and stir them well so that they are all covered. Marinade them for at least 3 hours (this can be done in a plastic bag) and periodically stir them or shake them to ensure they are coated in the marinade. Heat the oven to 180C/160C fan/gas mark 4. 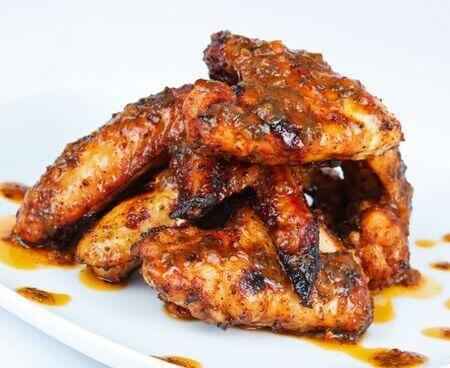 Remove the wings from the marinade and reserve. Transfer them onto a large baking tray and toss them in the oil. Bake in them oven for 30 minutes then pour off any excess oil and add the reserved marinade. Bake for a further 30 to 40 minutes, tossing them in the marinade a couple of times until they are sticky, glazed and golden. Remove to a serving dish, squeeze the juice of the second lime over them and garnish with the coriander leaves.